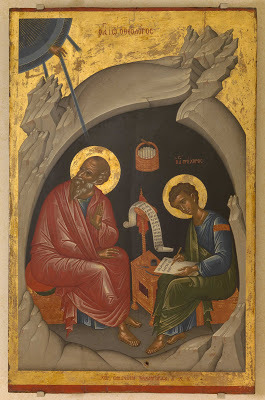 The Holy, Glorious All-laudable Apostle and Evangelist, Virgin, and Beloved Friend of Christ, John the Theologian was the son of Zebedee and Salome, a daughter of St Joseph the Betrothed. He was called by our Lord Jesus Christ to be one of His Apostles at the same time as his elder brother James. This took place at Lake Gennesareth (i.e. the Sea of Galilee). Leaving behind their father, both brothers followed the Lord. During the Last Supper, he reclined next to the Lord, and laid his head upon His breast. He also asked the name of the Savior’s betrayer. The Apostle John followed after the Lord when they led Him bound from the Garden of Gethsemane to the court of the iniquitous High Priests Annas and Caiphas. He was there in the courtyard of the High Priest during the interrogations of his Teacher and he resolutely followed after him on the way to Golgotha, grieving with all his heart. At the foot of the Cross he stood with the Mother of God and heard the words of the Crucified Lord addressed to Her from the Cross: “Woman, behold Thy son.” Then the Lord said to him, “Behold thy Mother” (John 19:26-27). From that moment the Apostle John, like a loving son, concerned himself over the Most Holy Virgin Mary, and he served Her until Her Dormition. The Apostle John withdrew with his disciple Prochorus to a desolate height, where he imposed upon himself a three-day fast. As St John prayed the earth quaked and thunder rumbled. Prochorus fell to the ground in fright. The Apostle John lifted him up and told him to write down what he was about to say. “I am the Alpha and the Omega, the beginning and the end, saith the Lord, Who is and Who was and Who is to come, the Almighty” (Rev 1:8), proclaimed the Spirit of God through the Apostle John. Thus in about the year 67 the Book of Revelation was written, known also as the “Apocalypse,” of the holy Apostle John the Theologian. In this Book were predictions of the tribulations of the Church and of the end of the world. After his prolonged exile, the Apostle John received his freedom and returned to Ephesus, where he continued with his activity, instructing Christians to guard against false teachers and their erroneous teachings. In the year 95, the Apostle John wrote his Gospel at Ephesus. He called for all Christians to love the Lord and one another, and by this to fulfill the commands of Christ. The Church calls St John the “Apostle of Love”, since he constantly taught that without love man cannot come near to God. Each year from the grave of the holy Apostle John on May 8 came forth a fine dust, which believers gathered up and were healed of sicknesses by it. Therefore, the Church also celebrates the memory of the holy Apostle John the Theologian on May 8. The Lord bestowed on His beloved disciple John and John’s brother James the name “Sons of Thunder” as an awesome messenger in its cleansing power of the heavenly fire. And precisely by this the Savior pointed out the flaming, fiery, sacrificial character of Christian love, the preacher of which was the Apostle John the Theologian. The eagle, symbol of the lofty heights of his theological thought, is the iconographic symbol of the Evangelist John the Theologian. The appellation “Theologian” is bestown by Holy Church only to St John among the immediate disciples and Apostles of Christ, as being the seer of the mysterious Judgments of God.